Imtec Battery Mark is a great tool that allows you to evaluate overall status of power system in your laptop and test it in the most extreme conditions. 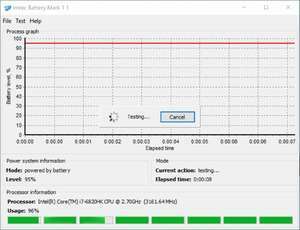 Battery Mark fully supports multi-and multicore processors, which allows to reproduce the maximum possible load on the processor system to test a laptop in extreme conditions. After the testing, the total assessment system power notebooks, calculated by a unique algorithm, taking into account not only the time of the battery, and laptop performance during testing. For security reasons, you should also check out the Imtec Battery Mark download at LO4D.com which includes virus and malware tests. Additional screenshots of this application download may be available, too.